East is placed at the top. The sun and moon hold lush forests. Jerusalem is the center of the world. And dragons hold the globe up at the bottom. But there is one aspect of the Psalter World Map, created in the 1260s, that is even stranger: a line-up of grotesque men located near Africa, two of whom have faces in their chests. monsters were often used to define boundaries and to express a distinction between morality and sin—or conformity and nonconformity. 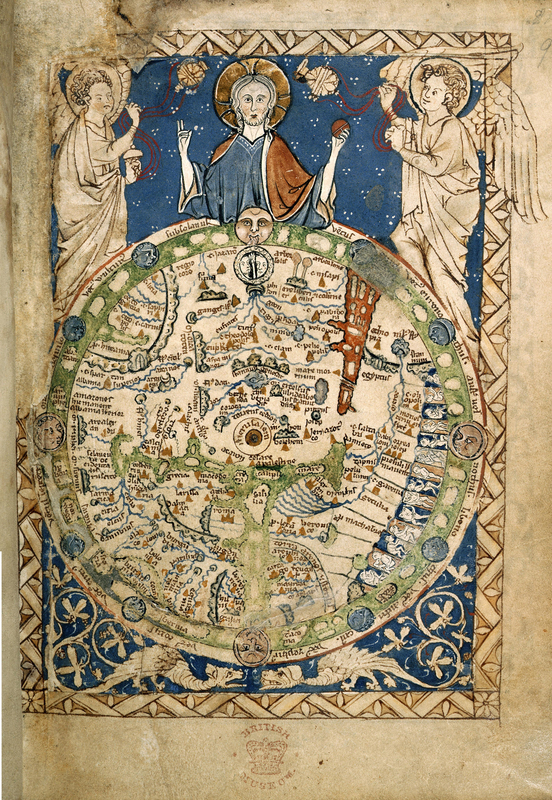 You can read part I of Monster-Spotting in this blog, or find out more about the Psalter World Map in Atlas Obscura. This post concludes a multi-part series of posts on ancient and Medieval wonders, to celebrate my 99c Pearseus: Rise of the Prince promo. As Pearseus has been described as “Ancient Greece in space,” it seemed strangely appropriate. I often wonder about some of the claims made in these times, Nick. What drove these guys to invent and lie about fantastic creatures? Are we talking about the medieval equivalent of Facebook status updates? Even worse, Tara. We’re talking Twitter status here. I wonder if in a thousand years, our descendents will wonder about the strange things we do and think. Seems almost a given 🙂 Another interesting post, Nicholas. Just bury that broken toaster in the back yard, and chuckle. Future archaeologist #1: Why is there a metal box buried behind the house? Future archaeologist #2: It must have religious significance. We can safely assume it was a totem of some sort. Future archaeologist #1: Doesn’t it look like a toaster? Future archaeologist #2: Perhaps it was an offering to the god of burnt toast. Since it was buried in the ground, it’s obvious this was an underworld deity. A truly amazing relic that is not only a work of art in itself, but tells us so much about the role of religion in the past. And of course, very few people would have seen it, or been able to understand it if they had. Fascinating, Nick! I love these old maps. Interesting that East was at the top. And hard to believe that any sane being could actually believe in such creatures, but then in Medieval times, people did become so superstitious and fearful of the Devil and his minions. Its a beautiful piece of artwork though, and an intriguing sight into the thinking of the day. I’m so glad you enjoyed it, Ali. Are you still around here? Just back in Ireland on Tuesday. Crete was fab! Really missing it. Hello stranger! I finished my first draft of my new book so I back now. Great post!